Get your tickets to high voltage fun today! 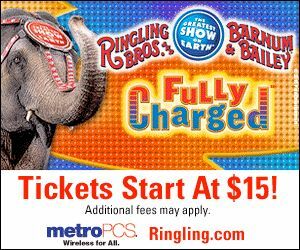 Don’t miss Fully Charged, the all-new surge of circus entertainment from Ringling Bros. and Barnum & Bailey where megawatts of thrills explode off of the arena floor with breathtaking dare-devilry, superhuman stunts and never-before-seen performances that energize children of all ages! The action at Fully Charged begins an hour before show time at the All Access Power Up Pre-show Party – FREE to all ticket holders. Get to know the world’s greatest performers, meet some our amazing animals in person, and work to become CircusFit all before the show starts! The All Access Power Up Pre-show Party is the only place where you can register for a chance to win a pachyderm painting created by one of Ringling Bros. artistic Asian elephants right before audiences’ eyes. You can only experience this current of excitement at Ringling Bros. Fully Charged! The amazing acts include Tabayara, a dynamic animal trainer whose rare ability to communicate with animals allows him to ride rearing stallions at a fully charged gallop and orchestrate majestic four-ton Asian Elephants in a symphony of dance. When he stands inside a cage, eye to eye with twelve ferocious tigers, Tabayara sees family where others see danger. The Fearless Fernandez Brothers dial up the thrills as they perform daring feats of athleticism on the Twin Turbines of Steel, including, extreme jumps and twists inside the moving wheels! Audiences will crackle with excitement as they watch Guillermo perform a three hundred sixty degree flying forward somersault, three stories in air, a feat so difficult it has only been attempted by one other person in the 141-year history of Ringling Bros. The Human Fuse, Brian Miser, sets the arena sky ablaze as he rockets through the air from his self-made human crossbow. Don’t blink as he flashes across the sky in less than a second, and travels 80 feet at 65 miles per hour. Use special code MOM20 to get 20% of your ticket purchase! Do You Want 4 FREE tickets for Your Family to See Fully Charged? North Texas Kids is giving away 4 tickets TWO SETS OF TICKETS! Entering this contest is easy — just do ONE of the following items. 1. Mention this contest on your Facebook page by sharing this post from our Facebook page and *tagging us (@north texas kids) in your post. Once you’re done, leave a comment here below and let us know that you’ve completed this action and also tell us what you love most about the circus! *Note that you can only share our post and tag us if you are a fan of our Facebook page and we can only see your shared post on our Facebook page if your post is designated as public. 2. Tweet about this contest and include @northtxkids plus a link to this contest in your tweet. Here’s the link: http://wp.me/p1Znzg-3FD. Once you’re done, leave a comment here below and let us know that you’ve completed this action and also tell us what you love most about the circus! 3. *Subscribe to our e-newsletter below and get more great contests, events and educational articles delivered to your inbox. Once you’re done, leave a comment here below and let us know that you’ve completed this action and also tell us what you love most about the circus! *Note, only new subscriptions count as an entry. If you’re already a subscriber, thanks! Try option #1 or #2. Contest ends on Sunday, July 22nd. Winners will be notified by email; the email you use to leave your comment below is the one that will be used for notification. ONE entry per person. ONE set of 4 tickets per family. I just signed up for the e-newsletter and I would love to win the tickets to the circus. I love the joy it brings to my kid’s the most. Personally I’ve always enjoyed anything to do with Lions. So intense and dangerous. Just subscribed to the e-newsletter, I haven’t been to circus since I was little and my four year old would love to see the elephants! I just shared the link on my facebook page. My favorite thing about the Circus is seeing the joy and delight that it brings my children. I personally love the clowns, they are always fun to see. I just tweeted and subscribed to the newsletter for circus tickets. My favorite part of the circus is the clowns!! I am already signed up for this newsletter but I resubmitted my information to ensure it is correct. I would love to win tickets for the circus for my daughter. I told her we couldn’t go to the circus this year because I couldn’t afford it. This would be an awesome surprise. I posted on Facebook & tagged you in it. I’m really hoping to win this since my youngest daughter has never been to the circus. I love seeing all the animals! My kid and I love the circus, brings back memories when i was little and my mom used to take me to the circus..it was great spending time with her that way. I shared the page on my Facebook page! I have been to the circus a few times my entire life and just love all the colors, excitment, laughter, smiles and entertainment the circus brings! I shared on my Facebook page. I have loved the circus since I was little. Now I enjoy watching my kids excitement when they see all the animals and entertainment that the circus entails. shared on facebook and signed up for newsletter. i just love the whole feeling of being at the circus, like a little kid again! I would love to win tickets to the circus! When I was little we always went to the shows. I have a grandson that would love to see all the action and the animals! His little face would light up. Just posted to my facebook page! I haven’t been to the Circus since I was a little girl and now I’d love to take my little boy! My favorite part was raising my hand and being picked to be a participant….what a treat! Other than that I love everything about the circus. Just tweeted! As for what I like best, I know it’s cliche, but I like the clowns. I just posted on your Facebook page!!! My daughter & I love the circus so much! We love all of the excitement & energy. The thing that we love the most are the elephants. It is so fascinating to see them perform tricks. Thanks!!! And my favorite part is the elephants! I’m always amazed at how well-trained they are! I shared on my FB page! Although I’ve only been once, I love the Ringling Bros Barnum & Bailey Circus because it reminds me of childhood memories of imagination and inspiration! I hope to continue those memories with our children! I shared your post on Facebook. I wasn’t sure about the tagging part. Is there something else I need to do? I shared this on my Facebook! My daughter really wants to go so I hope we are able to! Just posted to Facebook, and tagged your name to it as well. Crossing our fingers we win ,when i was a kid i would look forward to every year of the circus coming and knowing i was going. Now i love to see the expressions on our daughters faces when we mention the circus is in town and also when the clowns come out and do their acts , its the times like these that make family memories with them . I had no problem in sharing your post on my Facebook. My Grandson and I love the Circus! We love the clowns with their tricks and the acrobats! Signed up for newsletter. I would love to take my daughter to the real circus (ringling bros). She loves clowns and balloons and loved the small neighborhood circus, but would LOVE TO GO TO THE REAL THING. I just posted on facebook. Thanks for a chance to win tickets to the circus my boys love to go see the clowns and animals!! Signed up for newsletter. My son and I love the circus! I enjoy seeing the excitement in his eyes. I HAVE COMPLETED THIS ACTION (NEWSLETTER).. ALSO I POSTED IT ON FACEBOOK. AND I NEVER BEEN TO THE CIRCUS CUT NOW THAT I HAVE KIDS I WILL LOVE FOR THEM TO GO AND SEE THE ELEPHANT AND TRICKS. PLUS THIS IS THE BESTEST CIRCUS THERE IS SO I WILL LOVE TO GO. Shared on FB. We love watching the elephants at the circus! Hi…. I’ve Tweeted about this great give-away! Thanks “North Texas Kids”!!! Shared on my FB and I’m also a loyal subscriber ! Signed up for newsletter. I love the circus because it’s just as fun for the grown ups as it is for the kids. As a matter of fact, my first trip to the circus was when my husband took me for my birthday. Our 9 year old has gone once but the two year old hasn’t. I would love to see the circus through his eyes! I just shared the info on my page. Im 36 yrs old and can remember going once as a child. I haven’t been able to afford to take the kids when the circus came to town. We would really appreciate and be ever so grateful if we were to win. One of the things I think I would love is to see the reaction on my kids faces to the many different acts. I signed up for the newsletter and I remember going to the circus with my family. I want to create new memories with my child and husband going to the circus. My brother and I as kids were able to ride on an elephant and it was a thrill. We are so excited to take our son! Congratulations to our Ringling Bros. and Barnum & Bailey ® ticket giveaway winners! MCJ Johnson and Angela Carballo, you have each won a set of 4 tickets to see FULLY CHARGED! Look for an email from us with details. Enjoy the show! Thanks for participating in this giveaway everyone! Don’t forget, you can get a 20% discount on your purchase of circus tickets by using code MOM20 at ticketmaster.